From Sangenjaya, you take the classic tramway Setagya line going through residential areas to get to Bistro Trois-Quarts. You get off at a station called Shoin Jinjamae, the 3rd stop, and take the exit to cross the train tracks. It should take no more than 60 seconds from your first step off the train to the door of Bistro Trois-Quarts. Just as bistros are in France, Bistro Trois-Quarts is a fixture among the locals of Shoin Jinjamae. The place attracts not only people living in the area but also those who have left the area. Small restaurants with many regular customers tend to favor the neighborhood clientele and can be reclusive to new customers. 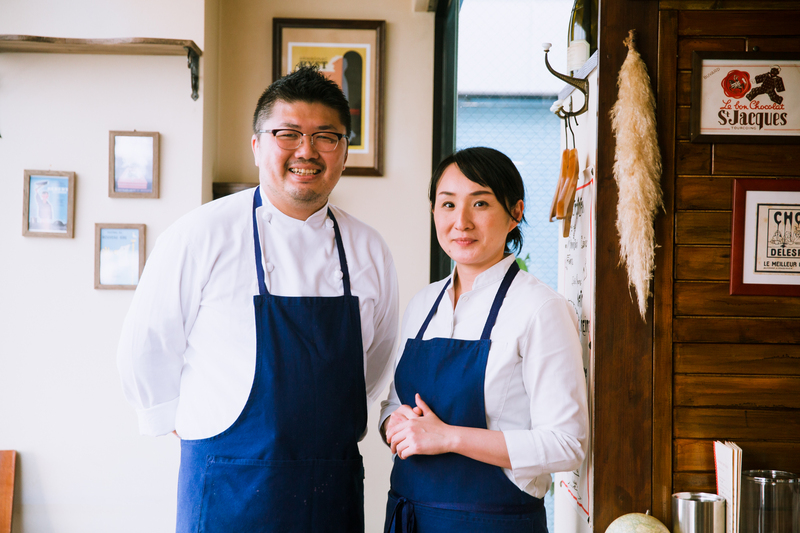 However, Bistro Trois-Quarts has a very warm friendly atmosphere created by the husband wife team of Chef Kinoshita and Mrs. Kinoshita. They simply want their bistro to be a place for everybody to enjoy quality food in a casual atmosphere. That’s why they named their place Trois-Quarts meaning 3/4 (three fourths) in French. They think that among the 4 most important elements of good restaurants, three are 1) food, 2) wine, and 3) hospitality. Chef Kinosita has a very unique culinary resume. He started working part time for a Japanese restaurant when he was 19 years old. Then, he obtained a cooking license and continued to work for Japanese restaurants. He even has the coveted license to cook blow fish as well. However, while he was moving up the ladder in Japanese restaurants, he was somehow lured by the attraction of French cuisine. So, he changed specialties and started learning and cooking French food. He was in his late 20s when he became a chef in charge of a small French restaurant. Since then, he has gratefully worked for understanding and supportive owners who gave him many opportunities to learn and cook whatever he wanted. 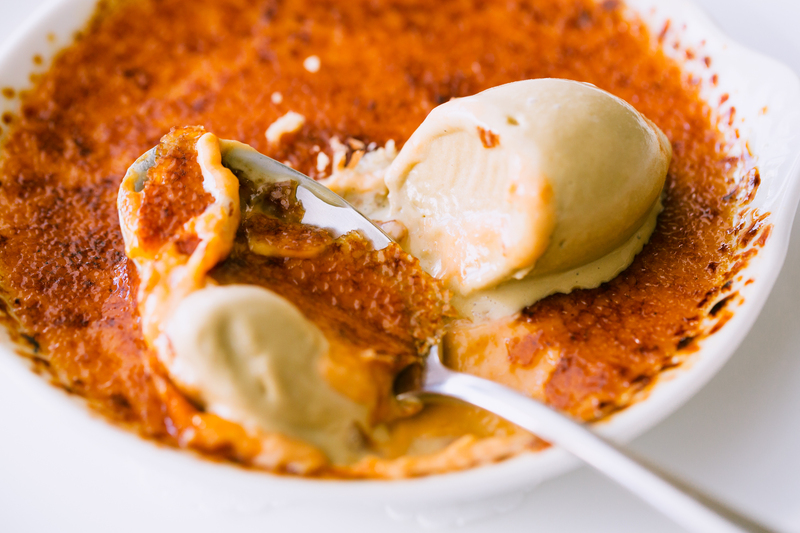 At Bistro Trois-Quarts, his own place, he cooks quintessential bistro fare with bold tastes. They taste authentic and pleasantly different from ones with localized tastes and flavors. The place is not large. However, you will not feel closed in. It makes this bistro located in a residential area in Setagaya a notch or two above so many bistros in downtown Tokyo. And, what is completing Trois-Quarts are its quality conscious customers lured by the bistro fare. They make this place 4/4, 100%. Chef Kinoshita humbly says, “Even though this is ordinary bistro fare, I would like it to taste really good”. 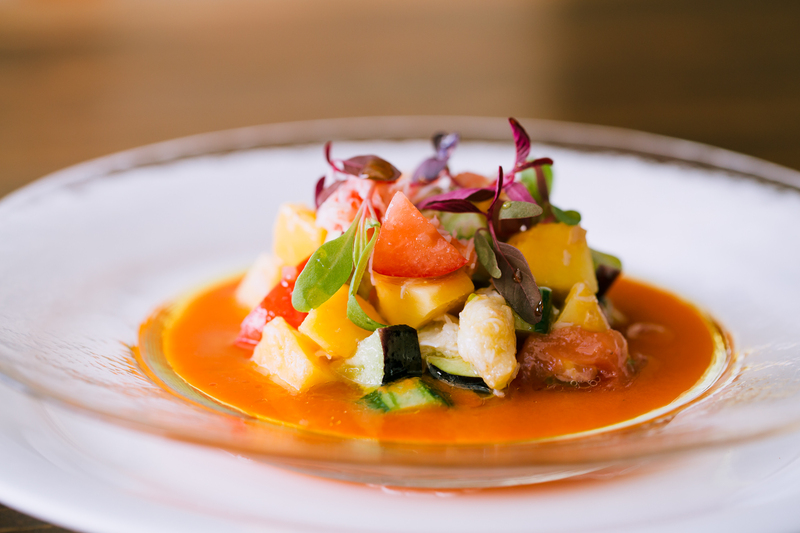 At Bistro Trois-Quarts, all dishes are priced reasonably. Bistro staples, “Pate de Campagne” (Country-style pate) is priced at 1,300 yen. Main dishes are priced from 2,300 yen. The very popular “Red Wine Stewed Beef Cheek” is 2,800 yen. In addition to the a la carte menu, the bistro offers two set course menus priced at 4,600 yen with appetizer, main dish and dessert, and 6,500 yen chef’s omakase menu which is highly recommended. Also, if you are using this bistro as a neighborhood wine bar, you can have small 500 yen dishes. And, you should not forget to order dessert. “Crème Brûlée” and “Fondant Chocolat” in autumn and winter, prepared by Mrs. Kinoshita are 700 yen and 1,000 yen respectively. The bistro offers two set course menus for lunch priced at 2,000 yen (appetizer + main dish + dessert + coffee) and 4,000 yen and 5,000 yen (chef’s omakase). By the glass wines are available from 7000 yen. Champagne by the glass is 1,100 yen. 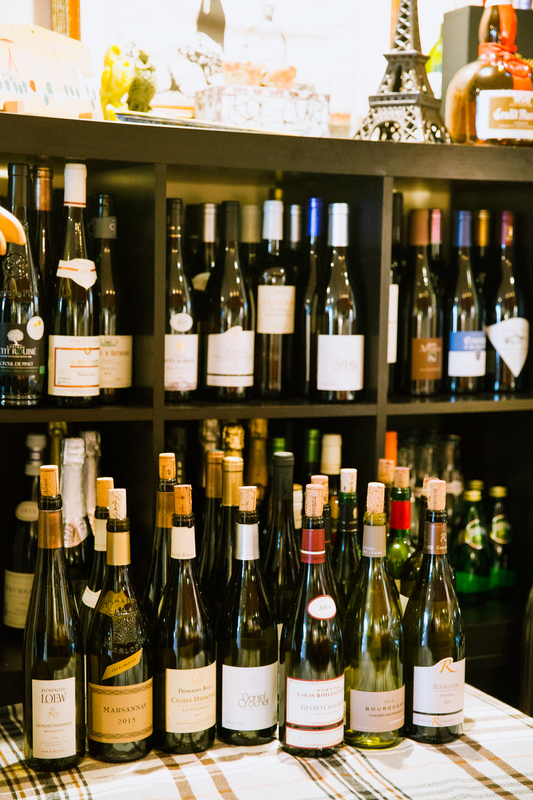 Wines on the list are exclusively from France and are available from 3,800 yen. 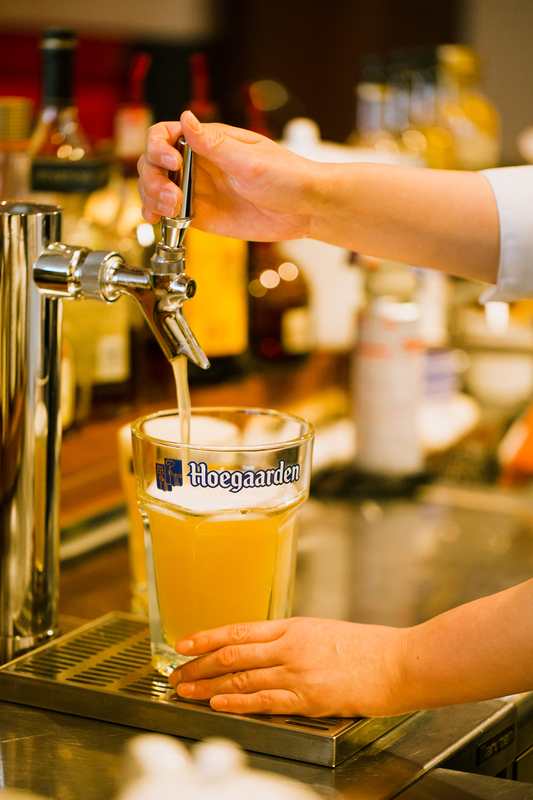 Also, it is good to know Hoegaarden White is available on tap. American Express, VISA & Master Card クレジット・カードの利用はディナーのみとなっています。 Please note that credit cards are not accepted for lunch.